Practical and environmentally friendly products and solutions where you need them most – in the office! Earth-friendly office supplies and products can help you save money by drastically reducing emissions caused by manufacturing, eliminating waste and increasing what goes in the recycling box! Recyclable paper, organic pencils, energy-efficient lights and computer monitors, natural printer inks – all of these amazing items gives you incredible workplace quality and efficiency while helping the planet stay green! With all the hustle and bustle that goes on in the office, it can be easy to think about the task at hand, rather than the planet as a whole. Arvee Corporation aims to help change the way your office operates by offering a wide-range of eco-friendly office supplies, paper and stationery. Affordable and efficient, you won’t believe how easy it can be to turn your office green – and you also won’t believe how much money your office will save by reducing the things you throw out and by getting more from your environmentally friendly office supplies. One lucky DSSM reader will win a pack of Greenciles (eco-friendly pencils) and an Eco-Stapler! What are these products you ask?! Let me tell you! Have you ever thought about what goes into making a pencil? First of all, a tree needs to be cut down in order to supply the wood. Then, lead needs to be inserted inside the pencil so you can write. When it’s all said and done, what you end up with is a standard, ordinary pencil that isn’t actually eco-friendly. And that process is only for one pencil. Now, multiply that by 14 billion, and that’s how many environmentally unfriendly pencils are produced and discarded each and every year. That’s quite a toll on forests, eco-systems and landfills. Greenciles® are the revolutionary, environmentally-sensitive pencils that are made completely of recycled paper. With no wood in them whatsoever, Greenciles® give you the same great writing quality that you would get from a standard 2HB pencil, but with a greater benefit to the planet and the environment. Traditional wood-based pencils are the result of heavy deforestation and manufacturing. In addition to harvesting wood, ordinary pencils need to be made in factories, thus increasing environmental harm and damage. Modern pencils are made by using an industrial-based method of mixing and firing, which ultimately ends up polluting the planet. With Greenciles®, no raw-materials are required or used. Instead, Greenciles® are made completely of recycled paper of all kinds: newsprint, printer paper, stationery, etc. The paper is cleaned, reused and wrapped around a safe graphite writing core. As a result, Greenciles® are the cleanest, safest and most environmentally-efficient pencils you can use anywhere – at home, at school, or in the office! Each Greencile® features a synthetic rubber tip, which makes it easy to erase your mistakes. Additionally, when you have to sharpen Greenciles®, instead of throwing out the pencil shreds, you can recycle them again! Eco-friendly Greenciles® started out as used or discarded paper. However, through an incredible and environmentally-responsible retrieval process, old paper now has a new life as a unique and functional pencil! More and more scientific studies are concluding that conventional wood pencils are doing more harm than good for the environment. Greenciles® eliminates the need to grow, cut down and harvest the wood necessary to create standard pencils. Greenciles® takes recycling and going green to a whole new level by taking paper and turning into pencils! Order your 10-pack of Greenciles® today and starting writing or drawing with an environmentally-friendly twist! Each year, billions of staples of thrown away and sent to landfills – causing harm to the environment. The Eco Stapler revolutionizes how you fasten papers together! That’s because, it doesn’t use any staples at all! > Metal staples need to be manufactured from pollution-spewing factories. The Eco Stapler doesn’t require any staples, which means there’s no metal mining and manufacturing needed. > Staples often get thrown away – while the extra paper from the Eco Stapler is eco-friendly because it can be recycled. 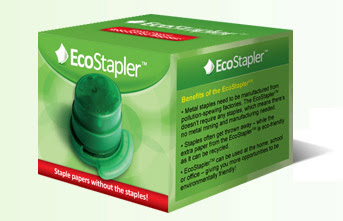 > Eco Stapler can be used at the home, school or office – giving you more opportunities to be environmentally friendly! *Comment on this post and let me know you did. I gotta get my hands on that "stapler" and try it out. Sounds fascinating. I hate staples because when I want to take the paper apart I end up ruining it all. commented on your stylish son!! post! I found it fantabulous about the Eco Stapler that it doesn't use staples. Now it makes me want to try it more. I can't picture it, but am glad that this is available for everyone. We need stuff like this. Wow, the stapler sounds really cool! My daughter is obsessed with making little booklets and she always wants me to staple them together for her and I worry that she'll scratch herself with sharp staple edges... this would be great for her to use! I love that stapler! I saw one like this at an art gallery in Buffalo years ago and have been regretting not buying it ever since. I love that it doesn't use staples, doesn't need refilling, it's the kind of thing that is so simple yet so smart! I am so thrilled to have found your blog..I just hope I'm not sending you a repeat of my comment. There was an error when I submitted it.....I do want to say how amazed I am at these prouducts! A pencil that the savings can be recycled!? How fantastic is that?! But the stapler with the capability of using "itself" to hold the paper together, I think that is a must have for everyone! Thank God for people with minds to do these wonderful things! NOW I have to go figure out how to get you on my homepage....I'm so new to all of this....I'll be back! Oh boy, now because I'm such a dummy, I put my email address in my comment that came up with an erroe reading but not in the one that counted.....I understand that you must stick to the rules.....I really do so I liked to add that another thing that amazed me about the "stapler" was that someone actually figured out how to use paper to hold paper together. my email address is: ido101202 at Yahoo dot com Thanks so much! I find it awesome that the stapler does not use staples! I'll have to admit that the Eco Stapler sounds really cool! I can't believe that it can actually hold 5 sheets of paper together without an actual staple! It amazes me that the stapleless stapler wasn't invented and put into use INSTEAD of the stapler we have now! I know back in the army that's how they used to "staple" items together (saw it on some tv show) so I'm surprised it didn't catch on - staples are painful! The Stapleless Stapler works on up to 5 sheets of paper, and it uses only the paper its “stapling” to fasten it together. ok...that stapler just sounds cool. I'm guilty of pitching many staples during my day job...this might be just the ticket to ending all that waste. I'm interested in seeing it in action. I love that the pencils are made from paper. There's something great about them being made from something they are used with. I love that the stapler doesn't use any staples! I cannot picture how it works but I would absolutely love to see it in action! My son staples paper together all the time to make small booklets...this would be great! I am amazed that the Eco stapler doesn't use any staples. I didn't know something like this existed. I had no idea they made eco pencils!!! Makes you think twice about everything! i am blown away by the staple free stapler! i neeeeeed one for my office! The Stapleless Stapler sounds great. It can be used at the home, school or office – giving us more opportunities to be environmentally friendly! I entered to win a Klean Kanteen today. Okay, a stapler that doesn't use staples? That's my favorite seeing as how I get sick of removing staples before recycling paper. i HATE dealing with staples to i'm really curious to see how this "stapler" works. i think i'd have too much fun with it. It amazes me that not one staple is needed and the papers are held together. This would be perfect for my son who is very into making comic books now. I'm amazed that it's stapleless. Thanks for the giveaway!